This skills program introduces the Leave No Trace traveling trainers. This couple spreads the word of Leave No Trace, but then they seem to leave a lasting impression. The Leave no trace Center for Outdoor Ethics teaches skills to help you keep your parks and wilderness areas in their best possible condition. You can minimize your impacts on these place so that others can enjoy them more, and you can enjoy them in the future. J.D. 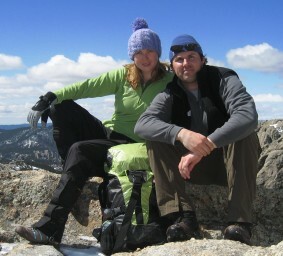 Tanner and Emily Ressler are this year's senior traveling trainers for Leave No Trace. They'll spend the year touring the country, attending festivals, and presenting classes on Leave No Trace principles to all kinds of people, from grade school students to professional mountain guides. We'll hear more from J.D and Emily in several future editions.